Primary school students are looking forward to the strike actions. 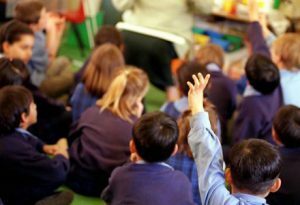 In two weeks time, primary school aged children across the country will be left to fend entirely for themselves, after New Zealand’s parenting union announced retaliatory measures against the planned primary school teachers’ strike. On August 15th, primary school teachers will go on strike for a full day, a move that will shut down schools across the country, leaving children nowhere to colour in 18-year-old worksheets. This was expected to leave children dangerously in the hands of their parents for the day, forcing them to take time out from their adult colouring-in jobs. But that will no longer be the case, after a late announcement this evening that over a hundred thousand adults will be walking from their jobs as parents, as a form of protest agaisnt the teachers’ strike. “Following a vote this afternoon, New Zealand parents will cease parenting at 6am on August 15th, and not resume parenting duties until 6am the following morning. “We do not take this action lightly, but feel our hands have been forced by the expansion of parenting time being requested of us by NZEI. “For too long, New Zealand’s primary school teachers have felt they can just dump our children with us from 3pm to 9am the next morning without paying us anything approaching reasonable compensation. PARENTZ said the parents of primary school aged children will refuse to acknowledge their childrens’ existence or let them into their homes for the duration of the strike. The move has raised the stakes in the standoff between teachers and the government, as many now fear landless, nomadic children will cause chaos, clogging up the arteries of major cities and forming roaming street gangs. Acting Prime Minister Winston Peters, who had earlier called the teachers’ strike “hugely disappointing,” threw more fuel on the fire just over an hour ago, saying that he was “fully behind” the parents’ strike. MPs across the political spectrum agreed, many of them vowing to fight the teachers’ protest by neglecting their children even more than they normally do. Prime Minister Jacinda Ardern will herself be joining the parents’ stand, starting her own parenting strike tomorrow.